Business is hard when you go at it alone … so don’t it. There’s power in relationships and accountability partners are necessary for achieving greatness in entrepreneurship, with the goal being to make each other better. I owe a ton to the several accountability partners I’ve had over the years. They’ve helped me stick to spiritual disciplines, writing projects, marketing initiatives, and other business activities. Accountability is a two-way street. I help my partners remain accountable for the tasks on their plate as well. Bond with a friend or business contact who is not a yes-person. You want an accountability partner who is honest. You need a big goal (or two) that you want to accomplish in a specific area of your business. You must break up your goals into specific smaller tasks. It helps to have an accountability person who is a systems/processes person if you struggle here. I certainly struggle in this area so I’m thankful for my accountability partner and brother-in-Christ Alzay Calhoun of Coveted Consultant. Alzay is a systems savant and an awesome dude. Make sure your accountability partner completes Steps 2 and 3. Commit to doing the tasks! Meet with each other at an agreed upon frequency and report your pains, wins, and losses to each other. Help each other improve at all costs. Pray over your meetings and the work to follow. The easiest way to find an accountability partner as an entrepreneur is to engage a friend who works in your industry. You want to work with someone who knows you, your business, and your needs. If you’re not an entrepreneur, find someone at your job. Many introverts don’t have big networks. As a writer, I know many introverts (other writers) and it’s important for them (me included, kinda’) to seek each other. In fact, I saw this type of connecting happen at Tim Grahl’s Bestseller Summit 2016 in Nashville last week. It was awesome to see hermits break out of their shells. If you need to expand your network, join your local Chamber of Commerce and network with its members. This is a good way to find an accountability partner. There’s power in this type of connection. I know of several marketing and business influencers who have built communities where the members partner up and help each other with goal setting, product review, collaboration and more. While not exactly a partnership, entire organizations can get in on the action and talk publicly about their goals, how they plan to achieve them, and their wins and losses along the way. This is an awesome form of accountability. You have customers, stakeholders, prospects, and team members watching to see how you manage to reach your goals (or not). The community can pitch in ideas to help the organization succeed. 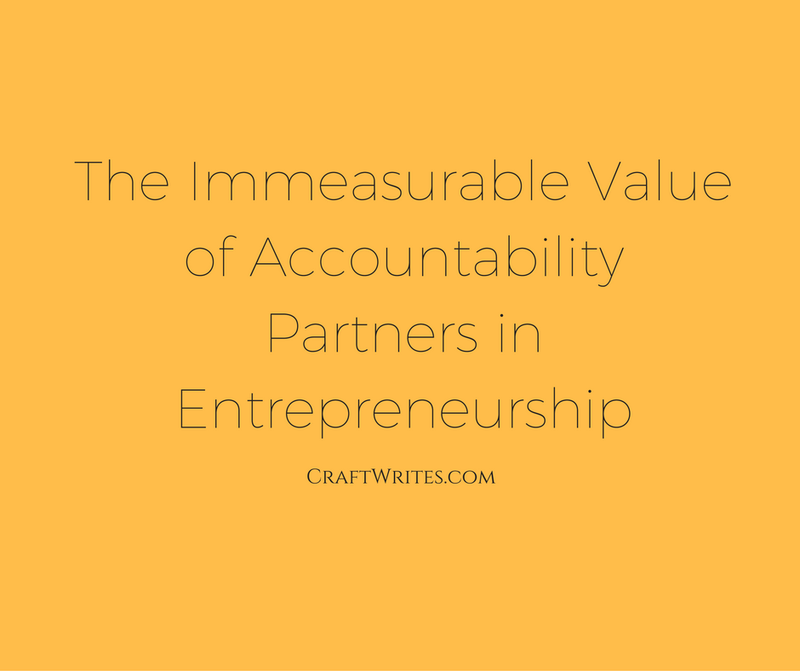 So you’ve found an accountability partner … how do you keep them? The first thing you must do is establish a consistent meeting schedule and stick to it. Next, you have to bring SMART (specific — measurable — achievable — results-focused — time-bound) goals to the table. Lastly, you must come to every meeting with your accountability partner with completed tasks or a strong effort! Your accountability partner won’t stick around for long if you don’t commit to your meetings or show up to them without doing the work. It motivates and inspires you to get quality work done faster. It gives you a way to measure progress. It creates opportunities for you to build community around entrepreneurial achievement. It helps in the fight against distraction and procrastination. It helps you validate ideas. It can lead to new business ideas. It creates opportunities for collaboration. Get the most out of your relationship with your accountability partner by challenging each other to do greater things. Don’t settle. If there’s no growth or improvement by each person in the in the partnership, the accountability relationship is dead. The goal is for everyone to go somewhere better personally and professionally. Remember that securing an accountability partner is only the first step. You have to do the work to achieve increased productivity and business growth! Stay on it and it will pay off for everyone. Speaking of partnerships and productivity, I’d like to become your partner for quality blog writing. Your business needs consistent content that increases your awareness and authority, but you don’t have time to write it. Call on us to help today.